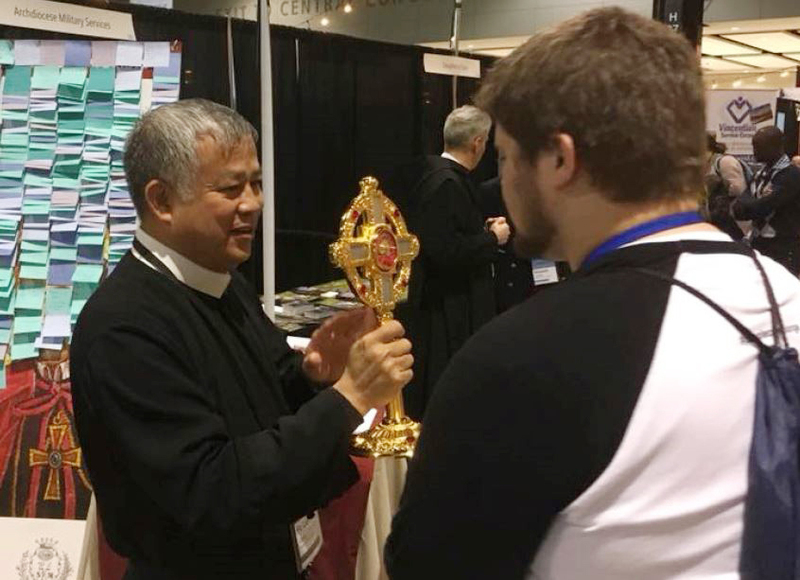 (United States) The Vocation directors of the Denver and Baltimore province began the work of vocation promotions with the Fellowship of Catholic University Students SEEK 2019 event attended by 17,000 mostly young people at the Indianapolis Convention Centre from 3rd to 7th January. God always provides good men for the Church. But Fr. Luong Uong and Fr. Lamar Partin, vocation directors for the Denver Province, are making sure that those who feel called to religious life and the priesthood know that the Redemptorists are a great option. “We have to be patient and be available to discuss a vocation with those who are interested,” Fr. Luong explained. “Just being with young Catholics at events gives me lots of hope for the future because they have so much enthusiasm and faith. It is a privilege to help young men discern a vocation and accompany them in the process.” Fr. Luong and Fr. Lamar visit parishes attend conferences and represent the Redemptorists at events throughout the country. They kicked off the New Year with Fr. 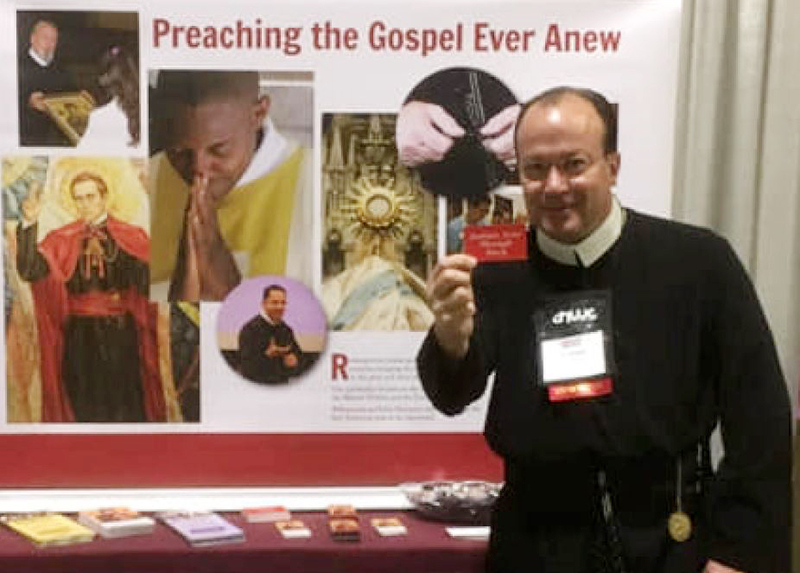 Matt Allman, vocation director of the Baltimore Province, at SEEK 2019 on January 3-7, and already have a full schedule of events planned before Easter (see accompanying list given below). 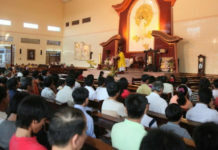 Redemptorist habits increase their visibility and the vocation directors offer special blessings with relics of Redemptorist saints and accept special prayer requests. 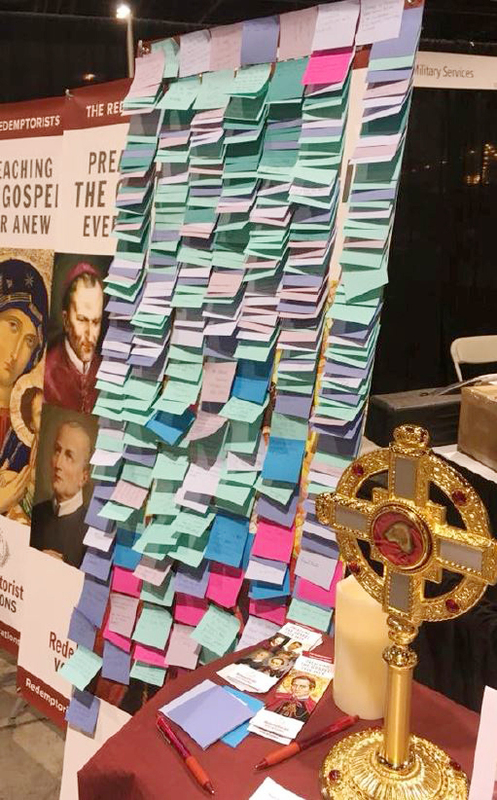 For example, they collected prayer requests to take to the Shrine of St. John Neumann in Philadelphia at SEEK 2019. 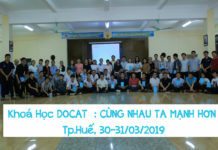 In addition to discussing vocations with potential candidates, they share their own vocation stories and convey their joy and fulfilment in a life dedicated to serving the People of God. 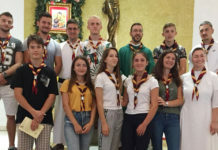 Youth groups at Redemptorist parishes and the Redemptorist Partners in Mission initiative, especially the Circles of Redemptorist Associates being formed in the Denver Province, also may be sources of vocation prospects. Fr. Luong and Fr. Lamar ask for continued prayers for vocations. 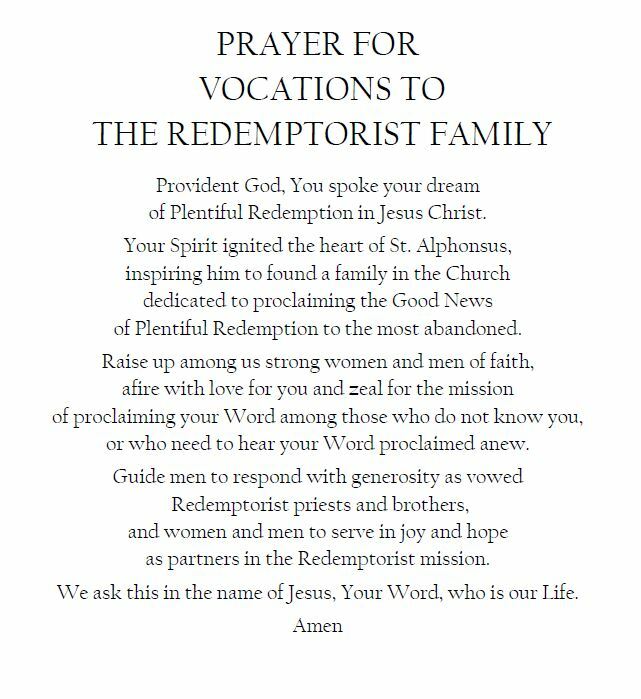 They recommend including this intention in the Prayers of the Faithful during Mass and praying for vocations during Eucharistic Adoration. Fr. Luong and Fr. Lamar regularly share news, so check the vocation website – http://www.redemptoristvocations.com – and Facebook posts for the latest updates.